question_answer1) What will come in the blank circle? question_answer2) Find the missing number. question_answer3) Fill in the blanks. question_answer4) Fill in the blank space. question_answer5) Fill in the blank space. question_answer6) Find the next number in the given series; 2, 5, 8. 11, ? question_answer10) Look at the pattern. What will be the next shape in the following pattern? question_answer11) Look at the pattern. What will be the next shape in the following pattern? question_answer12) Complete the number patterns in following questions. 3, __, 7, 9, 11, 13, 15.
question_answer13) Complete the number patterns in following questions. 11, __, 19, 23, 27.
question_answer14) Complete the number patterns. 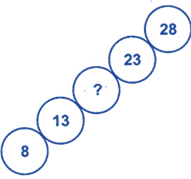 question_answer15) Complete the number patterns. question_answer16) Complete the number patterns. question_answer17) Complete the number patterns. question_answer18) Complete the number patterns. question_answer20) Find the missing object. question_answer21) Complete the number patterns in the following questions: 21. 6, 12, 18, 24, ______. question_answer22) Complete the number patterns in the following questions: 11, 22, _______, 44, 55.
question_answer23) Complete the number patterns in the following questions: 2, 8, _______, 20, 26.
question_answer24) Complete the number patterns in the following questions: 6, 5, 4, _______, 2, 1.
question_answer25) Study the numbers in the diagrams given below. Identify each pattern. Fill in the missing number in the empty row. question_answer26) Study the numbers in the diagrams given below. Identify each pattern. Fill in the missing number in the empty row. question_answer27) What will come in the placed following blank? question_answer28) Which one of the following options is correct to complete the numbers in the ladder? question_answer29) The following picture is greater than which one of the following options? Calculate in term of numbers. question_answer31) Find the missing number. question_answer34) What comes in the blank circle? question_answer35) What comes in the box given below. question_answer36) What comes next in the pattern? question_answer37) What comes next in the pattern? 32, 30, 28, 26, ___. question_answer38) What will be the next to complete the following pattern? question_answer41) Study the number patterns. Find the missing numbers in empty row. question_answer42) Complete the number pattern. question_answer43) Complete the number pattern. question_answer44) Complete the number pattern. question_answer45) Complete the number pattern. question_answer46) Complete the number pattern. question_answer47) Your mother purchased a wallpaper for your room which has beautiful pattern of pink flowers, birds and butterflies on it. Your younger brother unintentionally torn the wallpaper while playing in your room. What will you do in that situation? question_answer50) Choose the correct option that completes the given pattern.